Telemedicine has come a long way since the days when two-way radios and telephone lines enabled doctors to provide healthcare to patients at distant locations. Now, less than 30 years after the introduction of the first interactive telemedicine system—a defibrillator and monitor controlled over a phone line—physicians are poised to enter a world of robots and virtual reality that would once have been considered science fiction. Brent Tremblay of Pointmaker demonstrates the marking features of a Pointmaker on several medical images, including an X-ray of a shoulder. Telemedicine—broadly, the use of medical information exchanged from one site to another via electronic communications to improve a patient’s clinical health status—has been used for decades to deliver healthcare services to remote patients. But advancements in AV and information technologies, bolstered by ever-improving high-speed broadband access, now enable doctors to consult and participate in medical procedures in real time from the other side of the world. Anyone who has watched a live sports television broadcast will be familiar with the telestrator, which allows a commentator to indicate things of significance on the screen. Pointmaker, the Tucson, AZ-based company that introduced the technology, found a receptive audience among U.S. broadcasters, but soon saturated the relatively limited market. “In order to have a continuing business, we moved into AV, which has much broader applications, including medical,” said company president Pat Brey. The best example of Pointmaker’s application in telemedicine is videoconferencing, said Brey, whose “eureka” moment came at the National Institutes of Health (NIH) in Washington, DC, some years ago. The Pointmaker video annotation system utilizes a touchscreen that also displays the current presentation information. “The doctor touches the screen, circles the area of interest, that screen is connected to the Pointmaker, and the video with that information is relayed to the far end,” explained Brey. The system is also being used at San Diego Children’s Hospital, where several operating rooms feed an amphitheater where doctors and students can observe, he offered as an example. 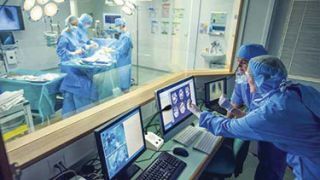 Earlier this year The Guardian newspaper in the U.K. reported on the world’s first operation to be streamed live in 360-degree video, from Barts Health Trust NHS in London. The surgical procedure, to remove a cancer tumor, was shot using two 360-degree cameras plus additional lenses around the operating room and could be viewed by medical students, trainee surgeons, and members of the public—including the reporter—on a virtual reality headset paired with a smartphone via the Medical Realities website and an app. A one-minute broadcast delay was inserted in case of complications. The surgeon, Dr. Shafi Ahmed, co-founded the Medical Realities healthcare company. The operation was streamed in partnership with Barts Health and Mativision, an immersive video expert. “Ahmed said he believes virtual reality, augmented reality, and games could all play a role in training medical students,” according to the article. Two years ago, Ahmed used the Google Glass augmented reality system to present viewers with his point of view during an operation. The report noted that Ahmed would like to add graphics in order to provide additional information during the operation, even taking questions from viewers. “[During an operation] I am teaching people, talking to them, there is communication going on—so it’ll be just an extension of that,” he told the reporter, Nicola Davis. “Companies are really working on various gloves or bodysuits and devices so that it can replicate touch and feel,” he added. Haptic devices capable of transmitting physical sensation will likely become more widely available during the next several years, the article stated. Tech Works offers communications products for sterile environments. “We built a number of Ebola isolation rooms during that epidemic,” he said, noting that the rooms are standing ready to address the Zika virus. The company’s products are also often found supplementing and integrated with medical digital imaging systems in the OR, he said. Close-up of an image of a human retina annotated with the Pointmaker during a videoconference. “The question becomes not only economical, but technically where is the best place to do your A-to-D conversion? In a very small environment where you’ve got no distance [such as an OR], you might just as well stay analog. The biggest change today in healthcare delivery in particular is the integration of digital into that environment,” said Dundas, especially VoIP communications.